Making their grand entrance in Spring, Asparagus is the perfect vegetable to include in warm or cool dishes. Which, let's face it, is perfect for our up and down weather at the moment. Asparagus is a very good source of fibre, foliate, vitamins A, C, E and K, as well as chromium, a trace mineral that enhances the ability of insulin to transport glucose from the bloodstream into cells. It's one of the top ranked fruits and vegetables for its ability to neutralize cell-damaging free radicals. This may help slow the aging process and reduce inflammation. These all mighty spears also act as a natural diuretic. Containing high levels of the amino acid asparagine, which not only releases fluid but helps rid the body of excess salts. In a medium bowl, whisk oil, 1/3 cup lemon juice, 1 tablespoon lemon zest, dill and parsley. Season vinaigrette with salt and pepper. Thinly slice asparagus diagonally. In a large bowl, toss asparagus with half the vinaigrette to coat. Set aside, tossing occasionally, for 5 mins or until asparagus has softened slightly. Fold in radishes. Season with salt and pepper. Arrange avocado slices on a large platter and top with asparagus mixture. Spoon remaining vinaigrette over salad. 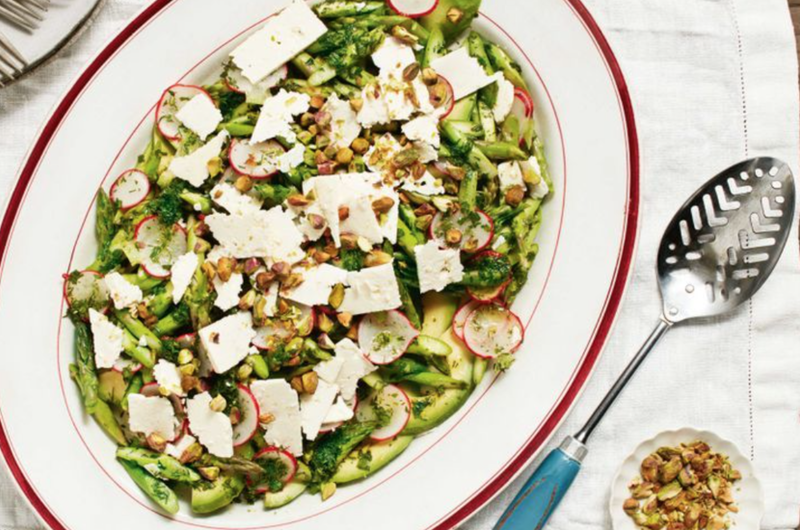 Sprinkle fetta and pistachios over and serve. Place the chicken in a saucepan and pour over enough water to just cover. Season with sea salt and freshly ground black pepper, then cover with a lid. Bring to the boil over high heat, then reduce the heat to medium and simmer for 10 minutes. Remove the lid and stand the chicken in the liquid for 10 minutes. Drain and thickly slice. Set aside. Combine vinegar, tamari, sesame oil, spring onions and sesame seeds in a bowl and whisk to combine. Divide the asparagus, salad leaves and chicken among serving plates and drizzle with the dressing. Preheat grill on high. Whisk the eggs, cream and dill together in a medium bowl. Season well with salt and pepper. Melt the butter in a large (20cm base measurement) frying pan over medium heat until foaming. Add the leek and cook, stirring, for 5 minutes or until leek softens. Add the asparagus and cook, stirring, for 2 minutes or until bright green and tender but still crisp. Pour egg mixture over the leek mixture in frying pan. Gently stir to combine. Reduce heat to low and cook for 4-5 minutes or until frittata is almost set but the top is still runny. Remove from heat. Sprinkle the goats cheese evenly over the top. Place the frying pan under preheated grill for 2 minutes or until frittata is set and top is lightly browned. Use a spatula to loosen the frittata and slide onto a clean work surface. Cut into wedges and place on serving plates. Serve immediately.